PLAYWRIGHTS Horizons’ many forays into the musical have always been disappointing. Sadly, “Far From Heaven,” based on the Todd Haynes film, proves to be no exception. In fact, the low expectations this reviewer had going in for "Far From Heaven," playing through 7 July, were exceeded. Richard Greenberg's book stays completely true to the TH motion picture, with music by Scott Frankel and lyrics by Michael Korie. None of this adds much to the rather thin tale. (See video above). As "Far From Heaven" opens, Cathy Whitaker (Kelli O'Hara) is a typical and very conventional New England housewife circa 1957, enjoying the beauties of her home and family. At its close, she seems to have been cast out of Eden to wander the earth alone. 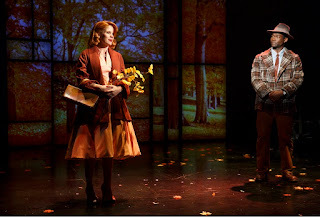 Forbidden love between Cathy (Kelli O'Hara) and Raymond (Isaiah Johnson) is blooming in "Far From Heaven." Photo by Joan Marcus. Here’s a second spoiler alert for those not familiar with the film, Cathy's story can be summed up as: my husband, Frank (Steven Pasquale), is gay and I'm in love with the gardener, who is shockingly, a black man named Raymond (Isaiah Johnson) … More shortly.